strPath is the path of the directory which the files and folder are in. The FileAttribute specifies what type of file or folder we are after. For more information about the FileAttribute parameter click here. I am trying to use your code to begin a selection process from a file directory. I need to access this file directory and go into each folder to match if a specific file name exists. The naming conventions are the same for each file that I want to isolate. For example: PlanIT_Timesheet_Data_2013_Dec. The name is the same for each file, except for the “2013_Dec” piece. That will change monthly, with the corresponding month and year for the file extract. I want to build and excel template that places the latest year_month combination in a single cell: i.e. the value would be “2014_Apr” because I just uploaded the April 2014 extract yesterday. I can use these last 8 characters to reference the most recent date, everytime. But it must reference the file name, not modified by date, as changes may occur after the file is placed in this directory. I need to do this for multiple file names, maybe 20. If I could have a column that displays a cell with the latest file date, with each row being the file name I am monitoring, this will have a great impact in my collection duties. Very hopeful you can help! Hello zapp10anth, thank you for visiting my website. I want to build and excel template that places the latest year_month combination in a single cell: i.e. the value would be “2014_Apr" because I just uploaded the April 2014 extract yesterday. 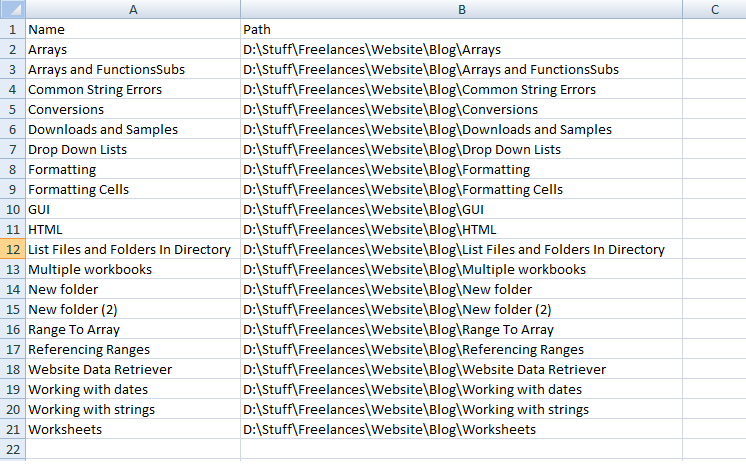 Hi, I have the folder keywords in column A and Directory( paths) in column B and i need a macro to search for the folder with the keyword in a directory and it should output folder present or not in column C and if present it should output the last modified date of the folder in column D.
the sub folders do not work on your code mate, the main folders do, any ideas? how can I skip those “.” and “..”? Thanks for a great article it was just what I’m looking for. 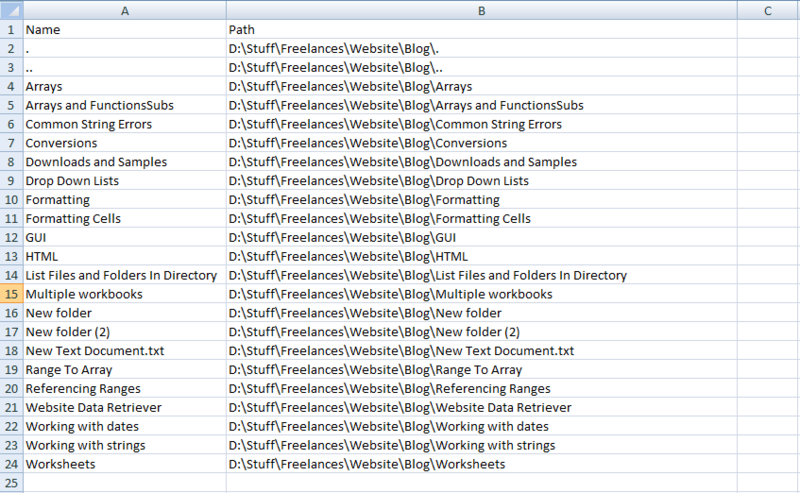 The problem is I’m not too familar with Excel VBA and I’d like to search for files in a directory. I would like it to go through all the rows of the sheet automatically until the end. Please send me an email so that I could help you out on this. Thanks for reaching out to help. I was desperate for a quick solution so I posted a project on Elance and got it sorted in an hour. Thanks again for the offer to help. can u pls provide the solution you found… its the exact requirement of mine. I hav 1000 images in a folder, i want their details like resolution, dimension, color mode, compression type, size of file and file name in excel, is there any possibility..? Pls suggest me with codes…..m nw learning abcd in vb..
Advance thanks and happy new year…. Advance thanks and happy new year…. . ……. Please send me a mail so that I can assist you with this. You can find my contact details on the contact page. I am trying to create a macro that lists the mp3 files in a folder, but I want the user to be able to choose a folder. I have the basic code for listing the files but how do I pass the path chosen from the folder open dialog to that code? I have Directory = “C:RandomFolder”, but how do I get the result of the folder open dialog in there? Please let me know if you are still experiencing any trouble. I have excel VBA file that can transfer name of file to excel sheet and automatically link on that file to view. Honestly the file is not mine, I only got from my colleague and I also don’t know how to create VBA but i want to learn. The excel file is protected if anyone can unlock the file, please give also to me. My email Kutsitis@yahoo.com. I want to use the last solution “Example 4” but when I run it in will just returns the main folder name and its address. please help me. This is a great tool! What drives the output order in excel? Is there a way to print the output sorted by name rather than what is default? Any help is much appreciated. I have tried your example4, however, it only listed the files but no folders….